Not *all* hand-and-a-half swords are more accurately yclept longswords, only most of them. The exception are hand-and-a-half swords that developed along with the early implementation of transitional armor between 1275 and 1325. These powerful and massive weapons were the beginning of the medieval longsword, and they were called grete swerdes or War Swords (since they're not quite yet what we think of a great swords, the true two-hander). In Ewart Oakeshott's classification, war swords are Type XIIIa. This reproduction isn't q-u-u-u-i-i-t-e an XIIIa, but it's stretching pretty close (if the blade cross-section were lenticular, it'd be there.) 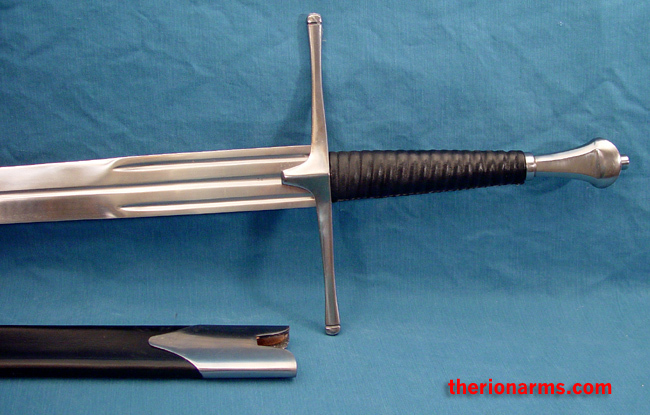 The blade is 1095 high carbon steel tempered to a tough spring, the grip is ridged wood wrapped with leather, the pommel and guard are steel, and the leather scabbard has steel fittings. 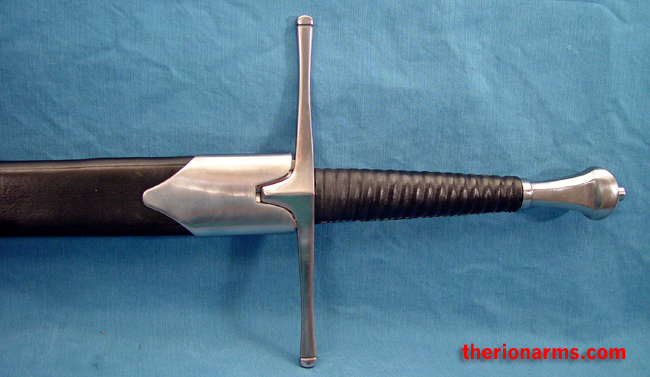 This sword has an unusually long blunt ricasso at the base of the blade, a gripping point that is also a precursor to the classical longsword's halfsword technique. grip and pommel: 9 3/8"